TVS Racing, undisputed leader in two-wheeler racing, announced an exclusive collaboration with the new Alisha Abdullah Racing Academy for Women– India’s first training school for women racers. TVS Racing will support the academy with the racing bikes and technical expertise. 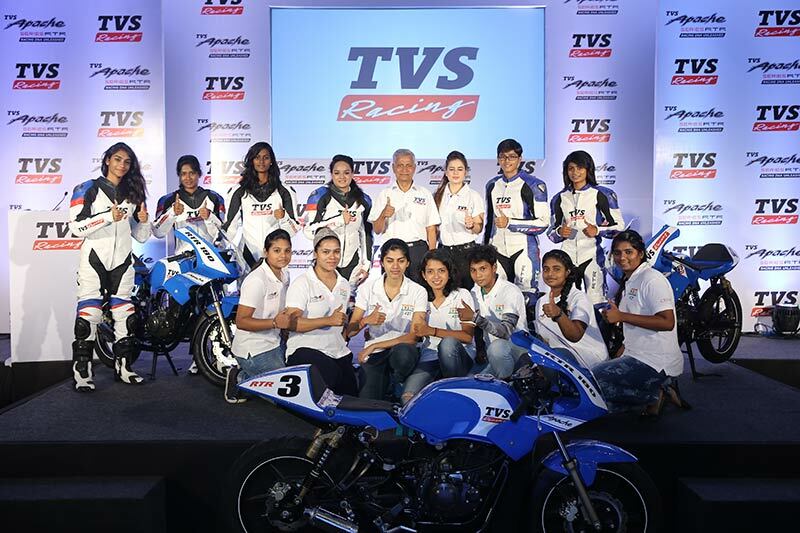 The academy has shortlisted 18 women riders who will race exclusively for TVS Racing Team in the first year. The first batch of 18 students at the Alisha Abdullah Racing Academy for Women has been selected from 80 entries after clearing rigorous tests. These riders are now being trained to improve physical fitness and hone their racing skills. The academy is based in Chennai and the racers will be trained on a hired racing track according to their training requirements. We are proud to be associated with TVS Racing as it is India’s most professional two-wheeler racing team with the best motorbikes and trainers. This association will help the academy develop the best talent among women racers as they get exclusive access to best in class machines, racers and technology. I also hope our racing academy attracts and encourages more women racers to get into motorsports in India. We are thrilled to collaborate with the Alisha Abdullah Racing Academy for Women and believe this initiative will help create opportunities for women racers in India. TVS Racing is strongly committed to promote two-wheeler racing in India and generate interest and improve support for the sport in India. We make continuous efforts to take the sport to as many sections of the society as possible and create the ultimate machine and promote the riders for these machines. TVS Racing was established in 1987 with the objective of improving the performance of its bikes. Over the years it has provided valuable data, design inputs, development of reliable motorcycle models, excellent vehicle dynamics & handling etc. The true evidence of it is seen in products like the new TVS Apache RTR 200 4V. TVS Racing has helped enhance the performance and handling capabilities of the TVS Apache series of motorcycles basis the experience on the track. Since the past 33 years TVS Racing has been actively participating on and off- road racing events such as road racing, Super-cross and Motocross, Dirt Tracks, Rally etc. TVS Racing is the only factory team in India to have any woman rider as a part of their team. In early 2015, TVS Racing became the first Indian factory team to take part in the Dakar rally, which is the longest and toughest rally in the world. TVS Racing won eight championships across all forms of two-wheeler motorsport events Supercross, Rallies and Road racing last year.